These days, it seems many children have difficulties reading situations, responding to people and situations appropriately, and being flexible thinkers. Sometimes, these children have been diagnosed with ADHD, autism or a related disorder and sometimes not. So how do we help children develop these social skills so they can function better in the world around them and lead happier lives? What is the Best Way to Develop Social Skills? For the last few years, I have attempted coaching my son through tough situations when they occurred. Of course, if he was in a full blown meltdown, we didn’t talk about it until he calmed down. 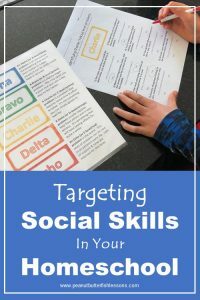 But, as much as possible, I tried to connect the coaching of social skills to real life situations. However, I found that we were making very little progress this way. Even though he was not in a meltdown in these moments, he usually was not using the part of the brain that would allow him to accept coaching and look at the situation in a different light. 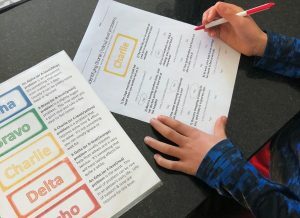 So I decided to take the plunge earlier this year and buy the DefCon Level Worksheets from Autism Homeschool Mama to work on my son’s overreaction to situations. You know, like when at age 9, he had a full meltdown because there was lettuce on his plate! He loved the worksheets! He would read each problem and determine what level of ‘threat’ it was and he was actually pretty good at doing this on paper. While I was happy to see this, I thought ‘see he does understand this stuff so these worksheets won’t help, he needs to learn this stuff in the moment.’ . But then he started to generalize the information right away. Of course, I gave him a perfect opportunity by spilling a pitcher of water by mistake and making a big commotion about it right after he finished some worksheets. “Mom,” he said, “it’s not like it is an Echo problem, it is only about a Bravo.” Aha! Maybe this method will work. We had many more discussions after that about the levels of problems in our every day life. The activity had given us the language to discuss problems in a different way, in a way that he felt he had more ownership because he had done the worksheets. And now we could apply this to real life! 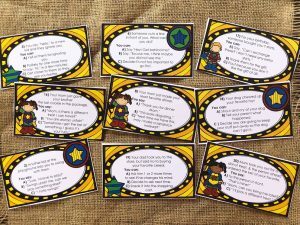 So I decided to buy the rest of the various social and behavior skills games and worksheets from Autism Homeschool Mama and have prepared eight sets to work through this summer. That may sound like a lot, but I wanted my son to be able to choose what interested him from day to day and many activities are short and to the point! Click the orange links to learn more about each activity or game. 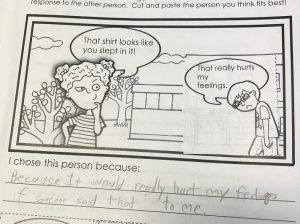 Reading the Situation: These worksheets show a picture of a situation with a person saying something. The child then picks one of three pictures of people saying different responses and glues the most likely one into the picture. I love the visual piece and the hands on piece of cutting and gluing! How to React-Match The Strategy: These are worksheets where a situation is depicted in a picture and then there are six choices around the picture for the child to choose which are appropriate and which are not. I like these because there are multiple correct answers. 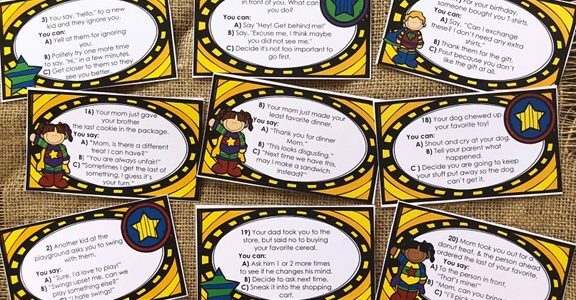 I Can Be a Superhero: This activity has 24 cards that offer a situation and then gives the child 3 possible ways to react and she has to choose the most appropriate. I picture using where my son takes a couple shots with his Nerf basketball after answering a question. You could also use with a board game. Is It Bullying: This is a board game that gives different scenarios and the child has to determine if the person’s actions are bullying. There is a good range of scenarios from children just wanting to be alone, to being annoying, to trying to have fun, to actual bullying. DefCon: Identify the Problem: These activities, worksheets and game utilize the military system of identifying the level of a problem. 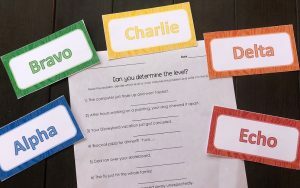 The military theme appealed to my boys and they liked using the Alpha (small problem), Bravo, Charlie, Delta, and Echo (worst problem) vocabulary to label problems. These are the activities we first started with out of this bundle. 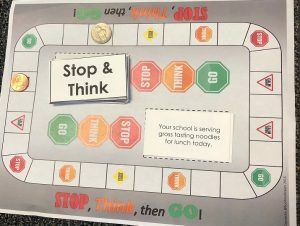 Stop, Think, Go: This is a board game that gives a situation that could potentially cause a meltdown and has the child stop and think of a good way to respond. It is much easier to come up with good solutions when not in the moment itself. An example situation is “Someone yanked a toy right out of your hands.” I know how that would go down in our house! Be a Flexible Thinker: There are a few different types of worksheets in this set. A rock is used to symbolize inflexible thinking and a rubber band is used to symbolize flexible thinking. The worksheet below is an example. 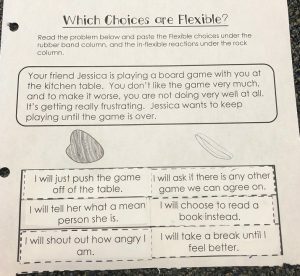 A scenario that my son sometimes has trouble with was given, doing poorly at a board game, and he had to divide the six possible responses between flexible and inflexible thinking. I particularly liked this because now we have a chart that I can keep with our games to review at the beginning of a game. If your child has been experiencing some of these challenges, I encourage you to check out some of these activities. In many ways, these skills are more important than the many academic skills we teach them and deserve the same level of time and effort! If you are interested in purchasing any of the above products, Autism Homeschool Mama has given readers of our blog a $5 off a $20 order coupon. Just use the code ‘pbfish’ at checkout!